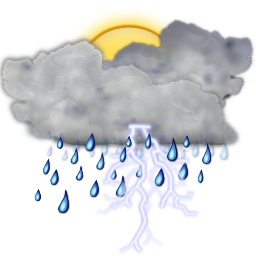 Wednesday September 11th is expected to be mostly cloudy with thunderstorms, with the high to be near 29°C/85°F, and the low to be 25°C/77°F, according to the Weather Underground. Winds are expected to be from the SSW at 50 to 60 km/h. Wednesday night is forecast to be overcast with thunderstorms. The relative humidity is expected to be near 84%. The Bermuda Weather Service have a Tropical Storm Warning valid as of 11.30pm [Sept 10]. The sunrise will be at 7.00am and sunset will be at 7.30pm. High tide will be at 12.56am and 1.31pm, while low tide will be at 7.03am and 8.10pm.